Shared by: AAC/AT INTERACT assessment team members in Craven County and also currently used by other AAC/AT professionals in Lee County. The concept of a communication ring was modified to make a portable set for staff working with children who need the support of visual symbols in the school or community environment. 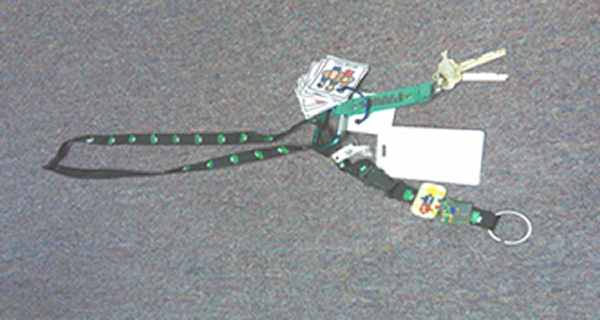 The smaller ring of pictures* is attached to the ID lanyard of the staff member. The picture choices can be tailored to the specific child and/or setting. Communication on the go! *(Picture possibilities: group time, snack time, work, listen, play, hands in lap. i.e., listen, play, hands in lap). 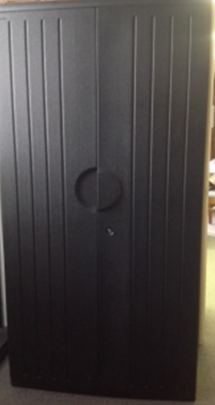 Shared by: AAC/AT INTERACT Assessment Team Members in Caswell County. Make a hand pocket with one piece of construction paper (laminated) by laying the paper landscape, then, fold 1-1.5 inches of the paper upwards. Next, flip the paper over, keeping it in landscape position. Fold the right side over to the left side to fold in half. Use glue (hot glue) to glue the top and open side of the pockets together, but DO NOT glue the bottom (where the folded edge is). Students will stick their hand in the bottom of the pocket. Use board maker to make yes/no cards. 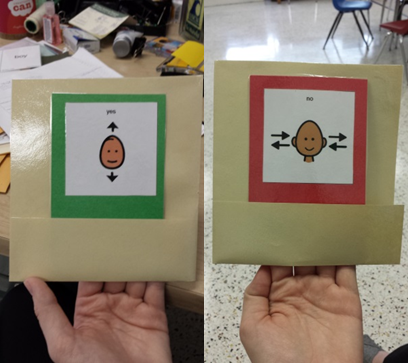 They can be made on green/red if students need help with yes/no or they can be on plain paper. Place the yes on one side, and no on the other side. Use cards for yes/no questions in class and allow students to answer questions together. This can help with motor skills and distinguishing yes from no. Shared by: AAC/AT INTERACT assessment team members in Davidson County. 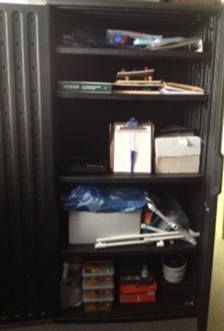 They found an empty cabinet to use for housing their AAC/AT materials at a central location and have a check-out list to manage their inventory. They have eye gaze kits, the TASP, a Forte Keyboard, adapted puzzles, etc. for check-out. Shared by: AAC/AT INTERACT assessment team members in Scotland County.